Microsoft is now selling pre-orders for a Surface Book with 1TB storage, a Core i7 processor, and an Nvidia GPU for $3,200. The 1TB Surface Book Microsoft teased at the laptop’s reveal is finally available for preorder, and boy, it’s expensive. For $3,200, the highest-end Surface Book packs an Intel Core i7 processor—Microsoft previously said the specific model would be the i7-6600U, a 2.6GHz dual-core processor with Intel HD graphics 520. The top Surface Book also has 16GB of RAM, 1TB of SSD storage, and a mysterious Nvidia graphics processor. 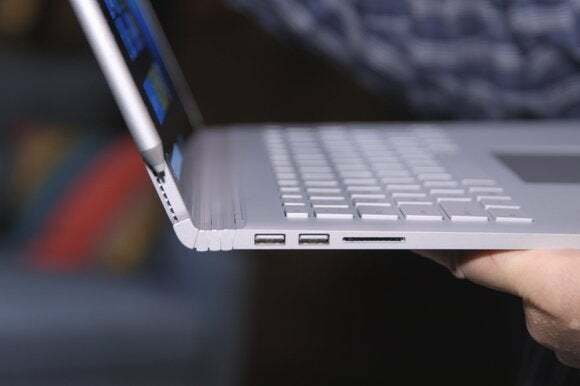 The rest of the specs remain the same as the other Surface Book models, including the 13.5-inch touchscreen display with 3000-by-2000 resolution, Windows 10, the Surface Pen, 802.11ac Wi-Fi, Bluetooth 4.0, two USB 3.0 ports, an SD card reader, a headset jack, and Mini DisplayPort. There’s also a 5 megapixel video chat camera and an 8MP one on the rear. The high-priced Surface Book won’t help you escape the long-waiting period for the next batch of Microsoft’s hybrids. Initial Surface Book pre-orders sold out quickly and buyers will now be waiting weeks. At this writing, the high-end Surface Book was expected to ship by January 22. Why this matters: Microsoft is hoping to redefine what a PC is with its approach to design. Just like the Surface tablets that came before it, the Surface Book is an innovative take on what a hybrid PC can be. PC shoppers were certainly taken with it, but PC manufacturers are split on the prospect of Microsoft’s increasing activity in the hardware space. Lenovo has already refused to help Microsoft by selling the Surface line next to ThinkPads, while Dell and HP are more receptive to surface resales. Meanwhile, it appears the mystery of the Surface Book’s discrete GPU is almost solved. A few curious Microsoft fans who have had some hands-on time with the Surface Book at the Microsoft Store were able to get GPU-Z running on the machines, as first reported by Hexus. GPU-Z is a diagnostic program that displays detailed specs about a PC’s GPU. According to several screenshots posted to Reddit, the mystery GPU is slightly underpowered compared to the GeForce 940M, an entry-level discrete graphics option. The mystery GPU features 1GB of dedicated GDDR5 memory, 954MHz base clock speed, 16 ROPs, and 384 shaders.